Albany’s former Woodland Square was a dilapidated trailer park but was aptly named for its big old trees. 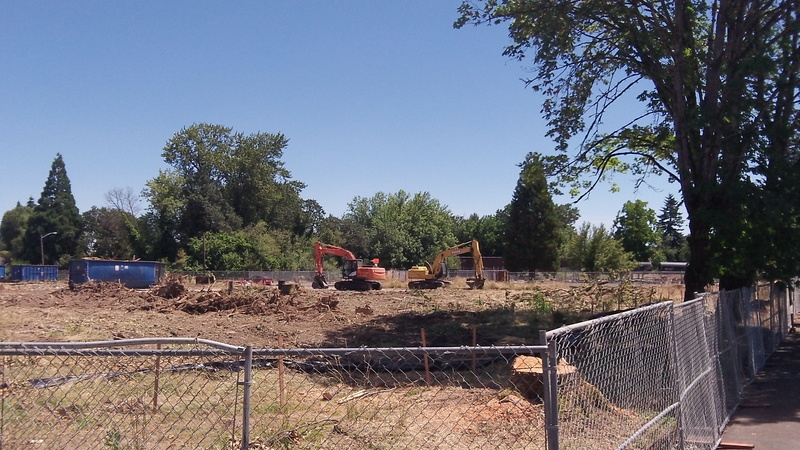 Soon it will be a new apartment complex with the same name, but for now it looks more like Stumpland Square. Innovative Housing Inc. of Portland is developing the $10 million-plus project with help from CARA, the Central Albany Revitalization Area, plus state tax credits and private financing. It had hoped to save many of the big shade trees that gave the property its name. 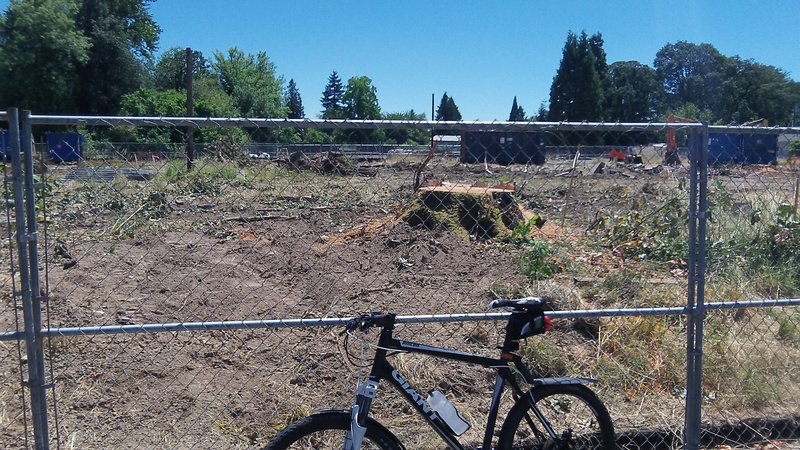 But when I rode past the place on Saturday, I was surprised to see mostly stumps. At far right, the survivors along Pine Street. Garver continued: “We are very happy that everyone agreed that we could save the last three trees on Pine Street. It will require tree protection during construction, pruning and good follow-up care, but it is worth it! 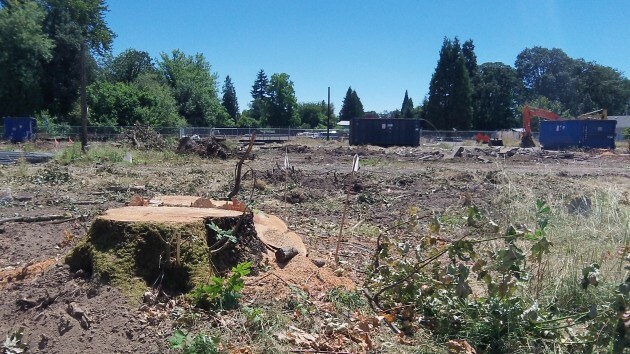 “Several trees on the interior of the site needed to be removed because they were in poor condition and would not make it through the disturbance of construction. In addition, quite a bit of parking is required for this project, and large trees do not typically do well with new paving all around them. In addition, all the ground floor units will have ADA-accessible entries with no steps. This is a great design feature and will benefit residents with limited mobility long into the future. But it did require lowering grades in the middle of the site, making it impossible to save one fir tree that we really wanted to save, because a majority of the roots would have had to have been cut away for the new grading and parking. The fir tree would not have survived under those conditions. “One piece of good news is that we are saving several trees in the creek canyon, which we are happy about. “It was a stressful two weeks, but we would like to thank city staff for working with us in partnership through the tree evaluation and decision process. I think everyone involved really hoped to save more trees. But the poor health of the trees, the parking required for the project and the first-floor-unit accessibility all contributed to the collective decisions about the trees. Too bad (they had to be killed. After all, as we learned from the environmentalists, Trees Are People Too! Developments are named after the things they destroy. Very fitting in this case.